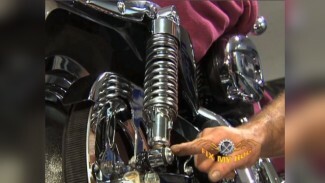 In this video, Mike covers a parasitic draw test for checking for, or measuring a draw on the battery of your Harley Davidson. Always be sure that you are using a quality, known good battery in your motorcycle. Sometimes an owner may be looking for a parasitic draw, but is really only dealing with a weak battery. The only way to definitively determine a battery’s health is to have it professionally load tested at a local garage. Fully charge a battery before performing a load test. When testing for a parasitic draw, it is important to use a multimeter that has a DC AMP setting. This setting is used for measuring amps or milliamps. Disconnect the ground cable from the battery. Connect the multimeter with alligator clips. One lead needs to be connected to the battery’s negative post and the other lead, to the negative battery cable. Now, read the meter’s result and compare it to the spec in your electrical manual. Different years and models will vary greatly. A touring Milwaukee Eight or Twin Cam that has a radio, and alarm system will have more draw on a battery than a Softail or Sportster. When trying to determine the source of a parasitic draw, start by looking at any accessories that may have been added to the motorcycle. Those are a common source of voltage draw. Especially when that electrical component may not have been specifically engineered for the motorcycle. Otherwise, unplug one electrical component at a time until the meter indicates that the draw has diminished. found mike;s description of what he was doing and why he was hooking up the meter very poor.